Talk of climate change in the mainstream media is primarily limited to abstract discussions about carbon dioxide emissions, melting ice, and rising sea-levels. Further, media attention tends to focus only on the most visible effects of Global Warming. Climate models show us that along with the melting of glaciers, coastal communities will cease to exist as present-day shorelines shift to higher altitudes. Even without the specter of Global Warming city planners and resource managers know that water supplies, already stretched by over-development and mismanagement will continue to be outpaced by the population growth. And, based on sheer volumes of emissions of being produced on an annual basis, the problem’s magnitude is constantly evolving for the worse. Yet, a unified global response continues to elude a world where national or even local interests trump the benefit of the greater population. With a cacophony of competing voices and entrenched power structures, progress over the last decades has been superficial at best. Misinformation and political apathy have created an environment where progress has been stymied at the expense of the Global Community. 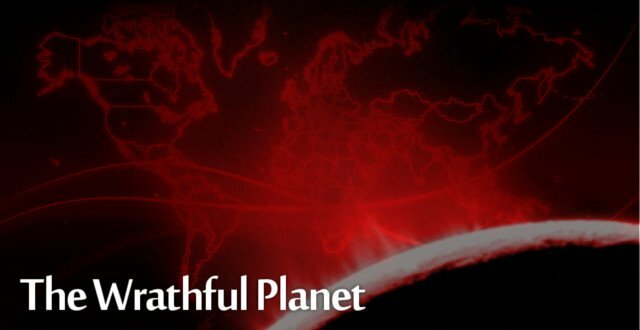 The Wrathful Planet series, of which you are reading the first edition, seeks to chronicle changes going on in our environment both in terms of scientific evidence and the psychological impact on Human societies. Changes in our planetary weather patterns are no different than disappearing resources or mass extinctions of life. It is the responsibility of the whole of Humanity to choose to pay heed to the signs and to take action, or not. But, keep in mind that the Earth rarely rewards excess and even less frequently offers second chances. Equilibrium and proportion will win out over instability in the end, whether or not Humanity deigns to participate. I’ve tweeted about this and shared a link on Facebook. It looks like you have carved out a good niche. Now comes the hard part: delivering on the promise. Good luck! Tell me about it my friend! So many good intentions, so little time to write! Thanks for the comment! There are many important points that this series will likely bring up. Not the least of which is it is too late to stop the warming train wreck. Ice samples show a pattern of rapid change over decades before settling into a warm or cold period. There are positive feedback mechanisms that can cause this.. methane release from former permafrost, methanehydride on sea floors etc. Humans need to be preparing for change, not fighting over who will pay to reduce CO2 emissions. It is far too late for doing anything about CO2. True true words, my friend. Thanks for the comment and for visiting!